A few months ago, I got sick of trying to deploy Django sites on my cPanel server and got a VPS at Slicehost. Thanks to SuperJared, setting up Apache/mod_python behind an Nginx frontend was a snap. I started deploying and migrating sites to the new server and kept an eye on my server resources via Munin. 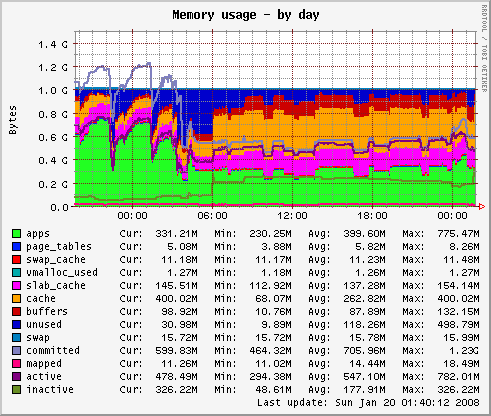 I had about 10 sites running on a 1GB Slice, but the Apache processes were hogging all the RAM. Restarting Apache would bring memory usage down to around 500MB, but within a couple of hours, it would be using all my available RAM, with individual proceesses using as much as 120MB. I started asking questions and trying different options including mod_wsgi, verifying projects weren’t in debug mode, etc. Nothing made a difference. Memory usage went from 800-900MB to ~300MB. Whoa! Each server was using 20-50MB. I ran some ab tests against it and found it actually held up quite well against Apache/mod_wsgi for low to medium traffic. As expected Apache scaled better to higher traffic. For my needs, CherryPy was more than enough. Advanced usage details including running on a different port, specifying SSL certs and spawning as a background process run by a different user are available by calling ./manage.py runcpserver help. Download django_cpserver, unzip and add it to your PYTHONPATH. Add django_cpserver to your INSTALLED_APPS. I highly recommend managing your background processes via Monit.